Watching the pair of them through a glass door, what do I see? Two hungry birds. Nature, in mid-winter, keeping itself alive. I look closer. The birds work together. One pecks, the other scans for danger. Two partners, one keeping watch and the other feeding. A beautiful friendship. 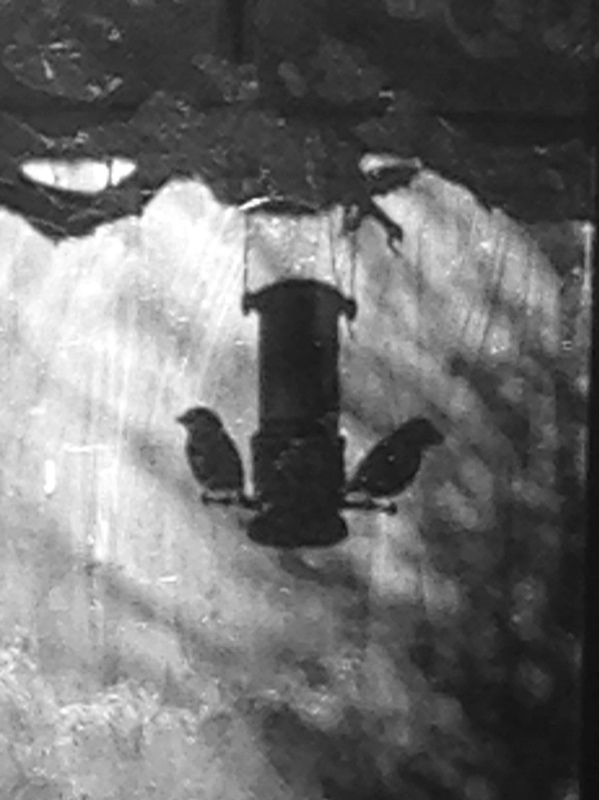 And then I see myself, excitedly hanging the feeder, hoping for a moment just like this one. Hoping some tiny birds might make it through cold days with nourishment from my garden. Inter-species friendship. A past act of mine making this current moment possible. But all the time I’m looking through a glass door. And there are many things I don’t see in this moment- a dim promise of reality in all its complexity. What beauty and connections do I miss? The seed growers, the reapers. Those seeds transported, stocked. All those human links in the chain leading to this moment. All those people supporting our feathered coinhabitants of this planet. I refill the bird feeder. Maybe next time I will understand more. For now, I am just hoping to see more of nature’s beautiful, flying creatures.